Thank you for purchasing a container from Nelson’s. We are very serious about and take much pride in growing the very best flowers possible. Our job is not complete at the time of the sale but until you have a successful growing season from beginning to end. Hopefully, the following instructions will be of much help to you. 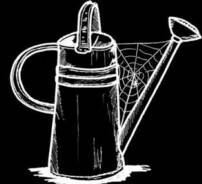 Watering – It is simple but very important that all containers need to dry out thoroughly between waterings. When the container is watered, it needs to be slowly and thoroughly saturated until the water is dripping from the bottom. It is better for the foliage of the flowers to wilt slightly than to water the container when it is already wet. The best way to check the container for water is to feel the weight of the pot or to swing a basket to the side to feel the weight. Feeling the soil with your fingers is not the most accurate way to determine watering needs. It is important to check all your containers for watering needs on a daily basis. Remember, most containers usually dry out at different times because of varying container sizes and amount of foliage. Watering frequency can be slowed by trimming back foliage with scissors on heavy foliage plants like petunias, especially when going away for an extended period of time. For those of you who do not like to make a “mess” on your porch/house when watering, please remember that your baskets/containers still need to be watered according to these instructions. If necessary remove from the location to water in your yard, let drain for a bit, and then rehang/reposition the baskets/containers. Be sure your water softener bypass is turned on or your water softener is shut off before watering. Salt negatively affects plants! Placement of Containers – Some flowering annuals can tolerate full all day sun, but most all annuals will do better with all half day sun. They usually do best in the morning sun or on the east side of the house. This is because of the cooler morning temperatures that are present when they are exposed to the sun. The north and south side of a building has changing light as the summer goes on. During the longest day of the summer, the north side of the house gets more sun than the south side of the house. In short, flowering containers will usually do their best on the east or west side of a structure. Many flowering annuals in containers succumb to inadequate sunlight exposure because containers get placed between the building and another obstacle such as a tree. Many baskets get tucked in under the edge of porch roofs and too close to the top of the ceiling of the porch. Baskets will do better if they are hung farther out toward the sunlight and next to the very edge of the porch. They need to be hung much lower (with an extender) for more sun exposure and to show off more of the basket from a distance. Flowering baskets should never be hung in an enclosed or screened in porch or inside your home. Our containers have been purposely grown to have a balanced look from 360 degrees but when placed directly against a building or on the edge of a porch they develop a wilting or yellowing side from lack of light, which sometimes cannot be helped. Turning the basket or containers shortens the light exposure to the entire container. Each side of the basket or container would then be getting ¼ day of sun at the most. Remember, the side exposed to the sun is the side usually seen from a distance. Simply check the sunlight requirement on the container tag and consider how much sunlight your container will receive at your intended location. Fertilizer – Fertilizer is absolutely essential for containers to do well for an entire season. We grow our containers using the maximum amount of fertilizer that they can tolerate so we achieve healthy and full plants. However, when they are sold, we no longer have control over the fertilizer input. We have found that Nutricote controlled-release fertilizer at the time of sale has worked well for our containers to last the entire season. We offer this complimentary service at the time of sale for all of our containers intended to be grown in for the entire season. Remember, there is still fertilizing required for all of your plants not supplied with time-released fertilizer. We sell Nutricote controlled-release fertilizer in pre-measured hanging basket portions and larger bags. We also suggest 20-20-20 water soluble (Miracle Gro type) fertilizer according to manufacturer’s directions. When relying on controlled release fertilizer, be sure not to leech too much water through the containers. Moss Baskets – Remember, moss baskets do not have a rim around the edge to hold water as it is poured in. You have to start to add water very slowly as not to erode the soil and plants around the edge. Living Wreaths – Living wreaths are best watered by laying them in a large container (such as a small baby pool) for a half an hour. Be sure to first dilute the proper amount of fertilizer in the water. You can also lay them on the ground and slowly water them with a sprinkling can of fertilized water. Always use fertilizer according to the manufacturer’s directions. Flower Pouches – Watering flower pouches can be difficult compared to hanging baskets. Pouches have roughly the same amount of soil as a hanging basket, but the hanging basket has a much larger opening. When watering a pouch, it must be done much more slowly than watering a hanging basket or container. Time must be given to allow the column of soil to soak up the water. Be careful that the water does not run between the back of the pouch and the column of soil. Some people plug up the holes in the bottom of the pouch until the soil is thoroughly saturated, then unplug the bottom and allow the excess water to flow out. Topiaries – The top of a topiary should be treated the same as a moss basket when watering. You have to start to add water very slowly as not to erode the soil and plants around the edge. The bottom of the topiary should be treated like a container when watering. (See watering section). Other Uses for Baskets and Containers – Using a 10-inch basket or 10-inch container is a great way to quickly fill a half barrel, urn or large pot, which will look nice for the entire season if taken care of according to the attached directions. For a printer-friendly copy of these directions, click here.